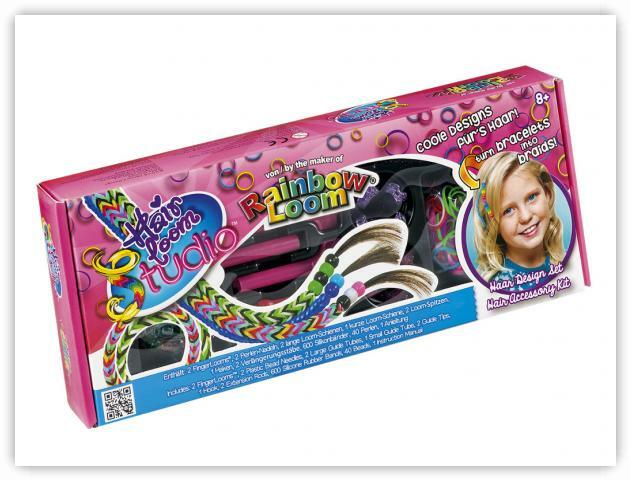 Another kit from the makers of the original Rainbow Loom - the Hair Loom Studio. This kit allows you to create a pattern in the hair. The loom itself is molded from a single piece of plastic and has 4 pegs and is essentially the Finger Loom. The kit includes 2 finger looms, 2 plastic bead needles, 2 large guide tubes, 1 small guide tube, 2 guide tips, 1 hook, 2 extension rods, 600 rubber bands, 40 beads..